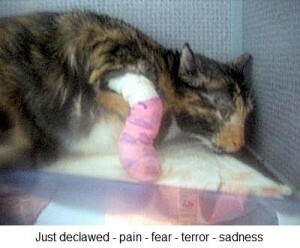 Declawing is an inhumane, unnecessary procedure that has many alternatives. It is never in the cat’s best interest. Simply put it’s “Training vs. Amputation”. Training a cat to use the proper scratching surfaces is really simple. Destructive scratching problems are 100% preventable and correctable. Providing the cat with suitable scratching areas (posts) to satisfy this instinctive behavior and encouraging the use of a proper place is generally all that is required. 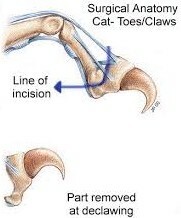 The term “declawing” makes people think only the claw is removed, but a more appropriate description would be amputation/mutilation. 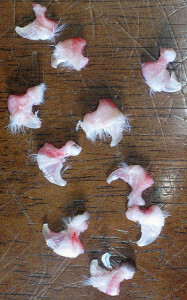 Declawing fits the dictionary definition of mutilation to a tee. Words such as deform, disfigure, disjoint, and dismember all apply to this surgery. It doesn’t matter how the procedure is preformed, scapula, guillotine or laser. Declawing is actually multiple amputations comparable to the removal of human fingertips at the first knuckle. Sensory and motor nerves are cut, damaged, and destroyed. Recovery from the surgery is a slow and a painful process. 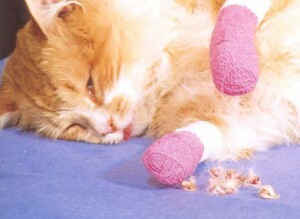 The pain from declawing is life long and normal cat behaviors are forever gone. This procedure keeps our cats from enjoying pain free things such as walking, running, springing, climbing, and stretching. This crippling procedure keeps our cats from a life of fun energetic normal cat behavior. This cruel procedure is evident when the cat is waking up from the from anesthesia following the brutal surgery, it results in cats bouncing off the walls of the recovery cage because of the excruciating pain. Some cats that are more stoic huddle in the corner of the recovery cage, immobilized in a state of helplessness, by the overwhelming pain. Much different than routine recoveries such as from neutering or spaying surgeries, which are fairly peaceful when over. Cat parents who elect to have their cats paws declawed generally do so with the belief that they will never have to deal with fabric damage due to destructive scratching problems or children being scratched. They don’t realize exactly what the process is. However, paw sensitivity (pain) resulting from the declaw operation may result in bitting, destructive chewing and litter box avoidance. Another set of other problems have developed from this procedure, now what do you do? You have your beloved cat crippled for life and now unable to preform necessary natural cat instinctual behaviors. It hurts to walk on the litter, they can’t get a good stretch and the pain is causing them to bite out at the fact when they try to use their claws there is only PAIN. Some cats after a declaw procedure can become nervous and defensive and display an undesirable temperament or behavior change. Usually when this happens the person responsible for the declawing would rather take the cat to a pound or shelter or have it euthanized by their veterinarian. Even worse, turn them out into the streets, totally defenseless and in pain. Not even trying to understand what they have done to their cat for them to behave this way. It’s a NO win for the cat! While declawing is a popular and lucrative practice in the United States, it is not practiced in European countries. It is, in fact, against the law, in many countries including England, Germany, and Switzerland.